Media sources (e.g. here and here) are reporting that Immigration and Customs Enforcement (ICE) agents went to the Iowa farm where the accused illegal alien killer of Mollie Tibbetts worked, using a phony identity, and initiated questioning of the others working on that farm. Bravo! 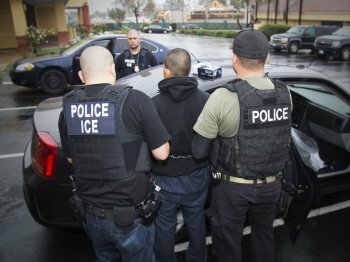 I would like to think that these agents, who are a part of the Homeland Security Investigations (HSI) division within ICE, took the initiative as a result of coordination and synergy with agents in the other major division of ICE, Enforcement and Removal Operations (ERO), who would be responsible for identifying and filing a detainer against the alleged murderer. This is the kind of coordination of efforts that makes the whole of ICE larger than its individual parts. But I doubt it happened that way. I have spoken before about the near dysfunction that exists within ICE because so many HSI agents and their bosses disdain doing Title 8 (Immigration and Nationality Act) work except under pressure from above. Undoubtedly that printed answer, carried in a national media outlet, aroused concern among ICE higher ups and obliged a local HSI reponse. Some media then asked whether farms and ranches could survive without illegal alien labor, and I will just say I think they could, but choose not to for "bottom line" purposes, but I don't want to get sidetracked here. The point is that what HSI did at Yarabee Farms in follow-up should be routine business. ERO apprehensions provide a gold mine of information about where illegal aliens are employed. While it might not be possible because of manpower constraints to conduct audits or worksite operations at all of them, it ought absolutely to be done any time an illegal alien who is illegally employed commits a significant crime. What better place to focus the agency's efforts, since both unlawful employment and alien crime are (or at least are purported to be) agency priorities? Using this logic, then it seems to me that HSI in Oregon should be following up on the killing in Salem, Ore., of a couple by a drunk illegal alien who was towing a fully loaded horse trailer at the time he struck the motorcycle. Exactly whose horse trailer was he pulling? Almost certainly not his own. The chances are strong that he was inebriated while on the job of an employer who chose to use cheap, unauthorized labor. Shouldn't that employer be looked at more closely? Who else might they be harboring?